Who knew that being a Princess was such deliriously tedious work? It wasn't anything even remotely entertaining, just lots and lots of busywork that hampered her research time like nopony's business! But all of that tediousness was instilled with great import, and she couldn't push any of it aside. In just a short time she was learning more about the working of government than she had ever wanted or feared, and over the course of the weeks and months that followed the time she had to spend on it only grew as small faux paus turned into mistakes that she simply needed to correct. It cut into research- and then it became a problem when it started to cut into time she could spend with her friends learning from their shared bonds, her most important task of all. After she had missed one or two spa appointments too many and forgot to help Applejack sort out the newest harvest due to Big Mac's illness, there was an intervention of a sorts staged. It came in the form of s'mores and pillow fights, makeovers and ghost stories and warm tidings all around. It was a sleepover with Rarity and Applejack and it went far better than the first time, even if a few gentle jokes sent her way about being a Princess were added to the festivities. It had been a lot of fun and as the night drew deep and they grew tired, each pony went to bed peacefully and happily. It was the perfect slumber party with some of her best friends on a beautiful night. Everything was going to be all right. Twilight panicked and fell off of her bed with a loud thump, her magic by reaction turning on the lights. She had seen a pair of beady dark eyes of colour she couldn't readily identify, but in the light of- well, not day, but in the light of light, there was nothing perched on her window. Sillyness abound, a simple nightmare image come to haunt her momentarily- the mind played such tricks! "Well, I shouldn't let that bother me, shouldn't I Spike?" She asked her likely sleeping dragon a rhetorical question, shooting a soft glance over to his little bed and finding...nothing. His little blanket was on the floor several feet away, but he was missing. Twilight looked around, then she felt a growing, gnawing sense of panic start to redouble itself every second as a fear started to fester at the edge of her mind. She looked around the house, her voice getting louder and louder and louder and more panic-stricken by the moment. With that last cry in the main room, Twilight shot up to the bedroom and started panic-stamping. Rarity gave a loud groan as she lie atop the bed, hardly asleep. Sleepovers with Twilight and Applejack had gotten increasingly easier to enjoy since the rather... tumultuous... first such event... but even so such nights never were particularly conducive to the fashionista finding her beauty sleep. No, even as her trust in the orange mare at her side continued to deepen and blossom, Applejack remained far from an ideal choice when it came to sharing a bed. The unpolished farmpony tossed and turned in her sleep, snored loudly and hogged the covers. Rarity had almost become accustomed to these restless nights, huddled up on her cramped, smaller half of the bed with nothing to cover her but her elegant and fashionable pink nightdress. It was about five seconds of sleep before Twi's shouting voice rang clear through the bedroom. The groggy unicorn blinked the sleep from her eyes repeatedly as she lifted her head slowly, letting the pillow atop it fall to the side of her disheveled mane. What was happening? Why was Twi shouting at this hour? What hour was it even? it couldn't already be morning could it. She gave another groan as she shook her head. Her eyes, when they were able to stay open, noticed it was still dark out. They also noticed that Twilight was not in her bed; no, she was at the door and she looked panicked. Rarity shook her head again, allowing her brain to catch up with what she had just heard Twi say. [colour=#663399] "Spike? "[/colour] she started as she sat up. [colour=#663399]"You mean to say Spike is missing? "[/colour] she added with more concern once she was fully caught up. [colour=#000000]Round two went better than the first. Applejack decided that a sequel to Twilight's slumber party with Rarity and herself wouldn't be such a bad idea. Had Rarity not been the kind of friend that can learn tolerance with her friends, that might not have been the case. But this time, everything was perfect. Applejack got to have fun with activities. The games were more enjoyable, her belly was full of more smore's and best of Rarity didn't rudely wake her up in the middle of the night. It seemed even Rarity was having a great snooze on the other side of the bed her and Applejack her sharing. Foggy images playing at the foremost edges of her rattling mind flooded back to Twilight, drowning out anything of use in their seeming infinity in that moment. What had happened? How could Spike just vanish? Was he angry- had she done something to wrong him? He was always a moody little dragon, but nice and the closest thing she had to a friend for the longest time. Nothing had been wrong- nothing, he said nothing. What had she done, if he had ran away? It was a maddening question, one that could almost drive a poor mare to tears. But another thought crossed her mind, one that didn't help calm her down much- what if he hadn't run away? What if he had been taken?! It wasn't completely out of the realm of possibility. She had seen a strange face in the night at her windowsill, the same face that had woken her up. Or had she just woken up and seen it? She didn't know. She couldn't tell. And it was a much better possibility by her own reckoning than Spike running away, even if that was mostly because she didn't want to do the mental gymnastics of understanding why it would happen. [colour=#4b0082]"Yes, Rarity! He was in his little bed and then something woke me up and he's gone!" [/colour]Twilight half trotted and fluttered to the window in a panic, eyes peering out in the cold sky which gave no clues nor revealed it's secrets. She turned back to Rarity to say something when Applejack's snoring, as melodious as it was, echoed around the room like a chamber. Of all the times for Applejack to be anything other than her usually stoic and reliable self was the time when Twilight's emotions were peaked and, quite frankly, loud noises didn't sit well with a mare just waking up. With a frustrated and annoyed grunt-sigh, Twilight levitated Applejack out of the covers, above the floor, and dropped her with a thud. [colour=#4b0082]"Applejack, Spike has been kidnapped!" [/colour]She didn't mention the other possibility which was still pulling at her as she nodded at both her friends,[colour=#4b0082] "and whoever took him couldn't have gone far! Come on! "[/colour] Twilight beckoned, leaping out of the window and taking flight. Her eyes scanned in all directions, looking for any sign- a rustling tree, a broken cloud, a swinging door. Nothing. No sign of Spike- where could he be?! Twilight was clearly in panic mode, as she spoke hurriedly to Rarity and then turned her attention to the still sleeping farm mare. Understandable as it was, Twilight was moving a little too fast, both for the still exhausted Rarity and likely for her own good as well. A Twilight Sparkle beset with worry was a fairly dangerous thing after all. If she didn't take the time to actually use that ever-impressive brain of hers, even a princess like Twilight would be of little use to her misplaced dragon companion. It would not be prudent to let fear alone kick them into action without any kind of plan. Twi failed to hear a word of what Rarity attempted to say, flying right out the window. Rarity sighed. Twilight and wings probably weren't the best of combinations, all things considered. They allowed what was already an often times too reckless mare access to even more recklessness. Now here she was charging off into the night without a plan, Rarity herself barely awake and Applejack not even out of bed. Rarity shook her head and just looked at the orange mare. Panic on the outside, panic on the inside, but Twilight's mind was still as sharp as ever. Despite the seeming chaos around her little could get in the way of her cutting logic and deduction when it was driven into overdrive or panicked and indeed it was both. The eyes in the night, peering at her- they seemed more malicious the more thought she gave to it. That noise, soft and almost pointlessly set aside as she scrambled for consciousness initially, possibly the sound of her getting away with Spike. Her? Him? It? And where to? The night was seemingly crueller than most, clouds blocking the sky and sucking starlight away after a nice scheduled storm was allowed to pass lazily in the night. The real factor was the wind. It wasn't harsh, but gusts stole her balance in the air as she flew haphazardly across town, yelling, [colour=#4b0082]"Spike! Spike! Spike! "[/colour] into every dark place. What a foalish thing to do, and she knew it- but she couldn't help herself. This felt...the situation shook her. Spike was her first friend outside of Shining Armor. She cared for him, fed him, raised him. In a sense, she was his mother or as close as he had. His caretaker. And she had failed him. Failure- she didn't do failure. A par of eyes in the night, dark but still visible at great distance in the dark in a way unidentifiable, with a smile of the same tint coming from a tree and what Twilight could swear was a burlap sack. She gave out a great gasp and tried to rush over there, but suddenly a gust of wind. And suddenly she remembered that she was still pretty awful. And not so suddenly, Twilight smacked into the Sugarcube Corner sign and fluttered to the ground. [colour=#4b0082]"Anypony get a number on that truck?" [/colour]She asked absentmindedly before losing consciousness. Twilight hadn't waited long for them, charging off on her own like a foal likely having not even heard Applejack's sound questions. Rarity sighed. How entirely maddening. She looked toward the orange mare and shook her head. Rarity began to run off in the direction Twilight had flown. She didn't have to run very far across town before her eyes settled on a purple mass of hooves and wings sitting at the foot of a large tree. She sighed again. Really? Twilight had already crashed into a tree? Wasn't Dash giving the princess flight lessons? She would have thought Twilight would be better than this by now. But no, she had crashed and now she was completely out cold. Rarity continued to sigh as she glanced down at the alicorn. [colour=#663399]"Simply unbelievable,"[/colour] she said through a huff. [colour=#663399]"I suppose for now all we can do is carry her back," [/colour]she muttered as she looked back to see if AJ had followed. [colour=#000000]Applejack rolled her eyes with Rarity. She agreed. However, she was still trying to determine how serious this incident was. Perhaps it wasn't like Spike to go off running away into the night. Applejack was sure she had ever heard of him doing that before. If anypony knew Spike it was Twilight, and despite Twilight being a silly filly alicorn who is obviously deprived of sleep and can't fly straight, she would know when something wrong was afoot. Applejack ran along side Rarity and when they arrived as Twilight's aide, they found her mashed into a tree next to the dimly lit Sugarcube Corner. It was very strange being out in downtown Ponyville when it was this dark. The area felt so quiet and ghostly. It was hard to imagine that it was the same are where Applejack smiled her way to many apple cart sales and typical errand runs. [/colour][colour=#ff0000]"Canned corn and beans, Rarity, she looks like she is out for the count. Lemme pick 'er up and take her back,"[/colour][colour=#000000] she said, almost defeated at the idea that Twilight had something important to say. Crazy, but also important. And she knew when Twilight awoke, she would be just as disillusioned as she was before. Rainbow Dash wanted desperately to be in bed. She fervently wanted to. Her schedule even said she was supposed to be in bed. Very clearly, in fact, did it desginate that she, Rainbow Dash, was no longer 'on duty', and was able to retire so she could get the very, very much needed sleep. And yet, despite that, here she was, flying night patrols around the Everfree. The Everfree, bane of the weather pony's life. If it wasn't for that place, their job would be SO much easier... no strange and unplanned storms, no bizarre and unnatural self-creating weather fronts, no spontaneous weather at all. It'd be ... *easy*. But the Everfree was there, and the dark, broody, troublemaking forest was, she was sure, laughing at her, because it waited till she was just about off duty before it started whipping up stormclouds, and when an Everyfree storm was in the brewing, Rainbow Dash needed to be ready. Still, she could at least wander all over the sky. She could see for miles, and it was the feel on her wings that would tell her something was up, if there was a breeze, so despite it being dark she was darting all over the sky pulling a few simpler practice techniques, stuff where she wouldn't run nearliyi as much risk of smashing into anything in the dark. Pulling out of one quadruple corkscrew, she saw a few light-coloured blotches moving through the night, down in Ponyville, and gave a soft groan. Some ponies. [colour=#ff4080]It had been a long night for Fluttershy. Late in the afternoon, Rainbow Dash had told her about the possibility of storms from the Everfree tonight. So Fluttershy had spent most of the evening making sure that all the animals and birds were sheltered before the bad weather came in. She'd invited as many of the little birds as she could into her cottage, so they wouldn't get blown around by high winds. The poor little things were so frightened, that it was late before she had gotten all of them to sleep. Even after that, Fluttershy herself couldn't sleep. Even a pegasus like herself, who didn't work with the weather, could tell that something was odd in the air tonight. Not to mention that, once her animal friends were safe, her own fear of storms took hold. Fluttershy hated thunderstorms, even the manufactured ones that the weather team set up. The wild storms that could come out of the Everfree were even worse! So it was that Fluttershy found herself huddled underneath her blankets, dreading the first peal of thunder. Because Fluttershy was so tensely awaiting sounds from the anticipated storm, she heard what sounded like someone moving around outside. A quick glance at at the moon outside her window showed her that it was much too early for anypony to be up and around. Curious, Fluttershy crept from her bed, pulling the covers along with her. Was there an animal outside trying to in in and away from the storm? Was it somepony that needed help? As she got closer to the door, she got the impression the whoever or whatever it was, they were moving quickly. Fluttershy opened her front door, just a crack, and looked outside. At first, she couldn't see anything. Then, she noticed some shadows moving away. She couldn't tell what kind of creature it was, but it was moving toward the edge of the forest. Concerned, Fluttershy poked her head out further, her blanket wrapped around her head like a hood. "Um, excuse me..." she called out. When she got no response, she raised the volume of her voice... a bit. "Um, I don't mean to intrude, but you really shouldn't be going into the forest right now." Still no answer, and the shape was getting further away with each moment. In what was nearly a shout of Fluttershy, she called out "There's a storm coming! Don't go in there!" But it was too late, the shdows had moved into the trees, and Fluttershy could no longer see any movement. Fluttershy swung her head around nervously. She didn't know who or what she had just seen, but they were in danger if they went into the forest tonight. She wasn't foolish enough to chase after them by herself, but... wait, what if she went for help? Rainbow and the weather ponies would be in the air, monitoring the storm. Maybe they could help find... whoever it was? With a flourish of her wings, Fluttershy shrugged off her blankets. She made sure to close the door behind her. Hopefully, she could find somepony quickly and get back home before the rain began. She quickly flew toward Ponyville, hoping to find somepony at the weather office. Twilight's second rest was as fitful as the first, troubled more so by such sudden unconsciousness that rudely shuttered the doors of the senses and ushered in a sort of malaise that transcended sleep. Her mind tried to formulate dreams but instead was met by an impressive and oppressive blackness. Her fcus had been so intense and she had been shuttered so quickly that for a time all that followed was her brain spinning in place, trying to place recent events into context. It tried mightily and failed in creating the separation in her memory from dream and waking, and soon the brief panic that had consumed her so was filed under dream. A nightmare, but an impossible one and not even the most wonderfully constructed one. It was half-flanked! Eyes in the night, running around, brief chaos, and a sudden end. The best nightmares had a story, something a creative mind could latch onto. Instead, this nightmare left her with nothing but questions and nothing to do about it. And so she rested, or did her best imitation of it. Finally, her addled consciousness rose above the tide and started to pull her up as well. Her eyes fluttered and her head rose from the pillow, taking in the light of her treehouse slowly. Immediately her head registered several degrees of pain, a subtle throbbing that was as annoying as it was painful. She slowly rose to her feet, wings flapping inconsquentially as she recalled what the heck was going on. Slumber party, then sleep, then an awful nightmare. Not the best chain of events but a night with friends was always better than a night alone, even if the circumstances were decidedly sour. She stretched and rubbed her head, residual disturbing memories of the nightmare fading, but a certain unsettling feeling remained. She couldn't place her hoof on it, but something was wrong. [colour=#800080]"Uggh, what happened to my head? I swear it feels as if I..."[/colour] She trailed off, eyes darting to and fro as she looked at the ground and then her assembled friends What were her pegasi friends doing here? They hadn't been invited...her worry grew. [colour=#800080]"Fluttershy, Rainbow Dash...? "[/colour] She shook her head, taking a deep breath as she turned her concerned gaze over to the invited guests. Something was wrong, very wrong, her hooves were clammy and something was wrong. Very wrong. [colour=#800080]"Where's Spike?" [/colour]She asked, her voice lowering as a terrible sense of foreboding creeped over her. No, no, that was a dream. Of course it was, it had to have been...oh Celestia it wasn't a dream! Rarity nodded at Applejack's assessment of the situation and proceeded to help the farm mare carry Twilight back to the library. As it were, while moving the unconscious princess, their movement was noticed by somepony up above. 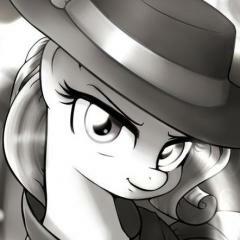 As Rarity's gaze went upward to Rainbow dash, she smiled faintly. The close friends that they were, they relay were pulled together by fate. In this confusing and potentially sinister mess of events, a pony like Rainbow Dash was just who they needed at their side. It was really quite a fortuitous event that she happened to come right to them. As if that weren't enough, just as they put Twilight down in the library, yet another dear friend entered suddenly. Rarity was quite taken aback at the sudden appearance of Fluttershy. Sudden appearances were very much anticipated with Dash, but definitely not for the meeker pegasus. Rarity immediately wondered if the yellow mare might have witnessed something. As both of them were asking the same question, Rarity supposed it was up to her to clarify the situation. As it were, however, Twilight began to stir before she could do just that. Of course, she was a hardly coherent mess of questions and panic. Rarity groaned and shook her head. As Rarity explained to the arriving friends the situation, Applejack grabbed some water in a glass and gave it to Twilight. "Simmer down, Twilight. We don't want you to hurt yourself any more than you already have." Applejack pushed her back down to a reclining position on the pillow. She also had a wet reg with her, and she cooled and wiped the Princesses forehead off as Twilight tried to recover. Applejack had done such care-taking for others before, mostly her little sister Apple Bloom whenever she would have a nightmare. Although, unlike her sister, Twilight seemed to still be a state of full fret. "Spikes not here Twilight, but we're going to help you figure out why. I'm sure he's ok. When was the last time you saw him?" Rainbow Dash groaned softly. "What did I tell you about night flying, Twilight? Don't you have, like, some sort of list you need to check before panicking, to remind you the right ways in which to panic?" Fluttershy fussed over Twilight as the alicorn rose to her hooves shakily. She thought of going into the kitchen to make an ice pack for Twilight, but Applejack already had a cool cloth on their friend's head. While Twilight was unsteady on her hooves, and her feathers were a mess from her crash, she seemed otherwise OK.
"Oh no! Poor little Spike!" Fluttershy moaned. She tried to think of where the baby dragon could have gone, and why. "Maybe... he went for a midnight snack? No, everything is closed... Oh no, Twilight, you and he didn't have a fight, did you?" Fluttershy began to pace, her wings flared in agitation. "Where could he have have gone in the middle of the night?" she asked out loud. "Nopony should be outside with that storm coming!" With mention of the storm, Fluttershy suddenly remembered why she herself was out at this time of night. "Oh my goodness, I forgot!" Fluttershy zipped over to Rainbow Dash. "Rainbow, I saw somepony... or someone.. heading into the Everfree Forest! I tried to get them to stop, but they didn't listen to me! I don't want anypony to get hurt by the storm!" Twilight would have been burning with a fair amount of shame concering her rather brash behavior if she wasn't overwhelmed by worry. It was true- she had dashed out into a stormy night with nary a thought. Heck, she had hardly been awake, let alone aware enough to fly accurately in the storm. The fact she kept on getting ribbed about that as if THAT was the most important issue didn't help. Spike wasn't here. He didn't run away every other week. He was a mature well, for his age- dragon and as loyal and dependable as they came. But she had to calm down, and she had to make sure that she thought this through. She took a deep breath, rubbed her head, and nodded. "It was reckless of me to just fly out there. I'm sorry, Rainbow Dash. I was just so worried- something is wrong and this isn't like Spike, not at all. Despite my headache," Twilight emphasized this as she rubbed her head, eliciting a few eye-twitches of pain, "I'm feeling better. Thank you two for picking me up and taking me here," She gave Rarity a half-hug, nodding towards Applejack as her mind started to turn the gears. She knew when Spike turned in. He had not been upset. He had no reason to run. He could be a clutz at night, and Owlicious would have told her if something changed before she herself left. That meant the time frame for his disappearance was brief. He wasn't good at being rushed suddenly. It didn't make sense that he would just leave...which meant she would have to assume he was taken. But where? Fluttershy provided the answer. Of course the Everfree! Whoever or whatever had done this would have used it as the perfect escape route. Assuming it was targeted, what better place to escape to? The Princesses held no power there. It was a wild land inhabited by wil things, where the imagination could hardly comprehend the magnitude of what existed in the dark crevices of the Everfree. That meant Spike was in great danger- her wings leapt out in panic as she almost failed to rein herself in as Fluttershy finished. "No, Fluttershy, we didn't have any sort of fight. He was just fine. He wasn't the biggest fan of Rarity's makeover, but I don't think he felt that bad about it," for obvious reasons she didn't need to say, "and he had a bit of a stomachache but that happens all the time. No reason for him to run, and he wouldn't have had the time- the time frame between Owlicious leaving, the three of us falling asleep, and when I woke up was too short," Twilight allowed a pregnant pause to take hold. "Assuming that he hasn't run away, I guess he's been...taken. Kidnapped," She sighed before looking around resolutely, "and whoever it is messed with the wrong mares. We'll rescue him, but we need to prepare. It wouldn't be, uhh, smart for us to go rushing off into the woods unprepared. Gather what you'll need- expect to spend at least a week but probably more in the Everfree. We'll meet near town hall in half an hour. Somepony, go and get Pinkie. Something tells me her Pinkie sense will be useful," Twilight stood and took a deep breath and looked around before nodding, her horn lit as she started putting materials in her saddlebag. Rarity listened to her friends and nodded. Applejack seemed intent to take things slow, which did seem smart. There was so much they didn't know and rushing off without knowing the facts they needed to know might lead to similar results as to what had just happened with Twilight. An offhoof comment from Fluttershy about somepony going into Everfree set Twilight off again, however, prompting her to want to move quickly, gather supplies and depart in a half hour's time. Rarity could definitely see where she was coming from here. There was no telling if the figure disappearing into the forest was connected to whatever might have happened, but if Spike truly had been taken into Everfree the poor dear was in danger. If that was even a possibility, they needed to leap into action as soon as possible, even if there was much they still didn't understand. "All right, darling. Sounds like a plan," she said, nodding. "I hate to think that we might be in that awful place for as much as a week, but it is always important to be prepared for whatever is thrown our way." "I'll return to the boutique and grab some essentials," she added, with a small nod as she headed for the exit. Applejack saluted to Twilight Sparkle. "You got it, Princess! I'll go get some packing food at the farm, and then head to Sugarcube Corner to wake Pinkie Pie up." With no haste, Applejack ran out of the library and started heading towards the farmscape. After a short visit to the pantry and fastening her saddlebag, Applejack made her way back to town. The clouds in the dark morning hid the moonlight from the ground, and in the distance, lightning strikes were making their first appearance. When she arrived at Sugarcube Corner, she knocked on the door a few times, ans panted for breathe from her gallop as she waited. Dash puffed out her chest and saluted proudly. She thought Twilight was over-reacting a bit - no real indication that there was a dragon-napping at hoof, but hey, quick romp through a scary forest - fun could be had from this. "Don't worry, Twi! We'll get'm back! I bet we'll be back here with snacks and coffee in ten hours flat! I'll get Pinkie Pie!" She darted off into the night, her brightly colored mane soon lost into the dark sky. She stopped off for only a moment to bang on Pinkie's window and wake her up, then let her know what the situation was in hurried words - letting her know to gather up some things and head off to Twilight's. "Especially some hay cakes if you can snag 'em!" she said with a grin and a wink. A while later, she showed up to the library with her saddlebags bulging with stuff, and an eager grin on her face. Fluttershy's eyes went wide at what Twilight was implying. The ponies... or whomever she had heard near her cottage... were the ones that had taken Spike?? He'd been dragon-napped? This was terrible! This was WORSE than terrible! Despite her shyness, Fluttershy always assumed the best about ponies and any other creature. The fact that she had tried to help someone who would kidnap a poor little baby dragon made her feel like her heart was being squeezed in a vice. Like Twilight, Fluttershy's first instinct was to rush headlong out into the night to try and help Spike. But the alicorn made the sensible decision that they needed time to prepare before galloping into the Everfree. Though the forest seemed to be quiescent with the effects of the Tree of Harmony, it was still not a place to wander into lightly. But, if they waited, how could they hope to find anyone in there? Suddenly, she remembered a new animal that had recently come into the shelter. Twilight had said to meet in a half hour. That gave her just enough time. "Oh oh! I know someone that can help us!" she cried out, and then flew off, almost as fast as Rainbow had. A half hour later, Fluttershy flapped back to the library, considerably slower than she had left. The yellow pegasus now had saddle bags across her back, and she carried a furry form in her forehooves. Entering the library, she set the creature down near her assembled friends. The long, wrinkled face of a black and tan dog looked around at the ponies, before yawning and lying back down. "Everypony," Fluttershy announced. "This is Wilfred. He's agreed to help us find Spike!" OOC- Well, no more waiting! If Pinkie wants to show up later, she has enough fourth wall breaking abilities to show up. We go now! Twilight had been on a few adventures, but this was different. She could feel it. This wasn't an abstract concept like the sanctity of knowledge she was defending, or a belief in the good of Equestria. This was Spike. Sometimes you simply did not understand how important something is to you until you no longer have it or could see it, and a singular, overriding panic was crushing Twilight as she gathered her supplies as stoically as she could. That she was responsible, at the very least indirectly, for what had happened to him. Some sort of plot against her because she was a Princess, and he was the hostage to get her to come to terms with the kidnappers? It seemed obvious but they hadn't left anything. It was enough to drive a lesser mare to madness and a superior mare to sadness, but Twilight knew that Spike was counting on her to get him out of whatever horrible situation he was in. With that thought steeling herself, Twilight went to work. -Rainbow Dash and Fluttershy were right there. Well, they were supposed to meet at Town Hall, but they moved fast. Twilight took to the air as well, nodding in approval and determination. "Good that we're all ready. Fluttershy, Wilfred is welcome. Maybe Applejack brought Winona, too. That'd be a help. Okay everypony, lets go to Town Hall and meet the others and save Spike!" Twilight punctuated those words with a fierce cut of wind past Rainbow Dash and deep into town. Rarity was waiting at town hall already. She had taken the time to accessorize as best she could for a venture into the Everfree. She had equipped herself with a set of sturdy leather boots, a fashionable and functional dark green travelling cloak and and obnoxiously over packed backpack holding her necessities--including a roll up tent, pillows, a sleeping bag, mane care supplies, a first aid kit, some food and some water. It was a significantly scaled back number of items from her usual travelling supplies. Certainly it was less than she had brought when she had went camping with Rainbow Dash, Applejack and Sweetie and her little friends. It was even less than she typically brought with her as luggage when she was staying somewhere nice. Rarity was willing to make more sacrifices to her comfort than usual if it meant being able to find Spike though. She had been happy to cut back and only bring the items she really felt like she would need. Eventually she noticed Twilight, Dash and Fluttershy flying to meet her. She raised a hoof to wave at them. "I'm all ready when you are, darlings," she said with a serious nod. "Let's hurry and go find Spike!" she added. She was ready to do whatever it would take to bring her little dragon friend back to Ponyville. Applejack arrived at town hall, seeing only Rarity. Applejack was slightly out of breathe, as she was hurrying from the farm and sugar cube corner, expecting herself to be a little behind the others since she had more terrain to travel. When she got there, she exhaled and sat on her haunches next to Rarity, temporarily dropping the small travel bag she had with her. In her bag was some essential food supplies, all made from apples of course, and a collapsible tent. She was going to bring a bedroll, but she figured it would be best to either share with somepony else, or find something that didn't require carrying to sleep on. Applejack knew how to sleep on a rock when she had to. "Well, I knocked on Pinkie's door for about five minutes and got nothing. She must sound asleep still. Hay, where are the others?"